When me, my dad, my friend Molly, her dad and some other people in my family booked “lean-tos” at Roaring Brook Campground, I was psyched to go. This was my first ascent of Katahdin or any other big mountain like it. We started climbing the morning of August 21, 2017. We planned to climb up to Chimney Pond and then do Cathedral Trail to Baxter Peak and come back down in one day. That day was also the day of the solar eclipse. So we also planned on seeing the eclipse on the mountain with our special NASA glasses. Once we started hiking, we got amazing views through the trees of the mountain. Then we saw the top of Katahdin. I couldn’t believe we would be there in a couple of hours. When we arrived at Chimney Pond our legs were tired from hiking nonstop for about an hour. We walked up to the edge of the pond and looked up at the mountain. It was probably one of the most beautiful sights I’ve ever seen: the sun sparkling on the water and the robin egg colored sky next to the massive Baxter Peak of Katahdin. We stayed there for maybe ten minutes and ate small snacks and admired the scene. After that, we started out on Cathedral Trail. I was really excited because we were going to scale big boulders on the side of the mountain which sounded real fun. As we kept getting higher on the trail, the trees were disappearing and there were more and more rocks. I thought Cathedral Trail was just going to be hard and tiring, but it was also extremely fun. Just scrambling over the rocks and figuring out where I was going to put my foot next was exciting. We kept getting closer and closer to Baxter Peak until I could finally see the top just a few hundred steps farther away. I kept walking and walking giving it everything I had, and finally I stepped onto the summit. From there I could see trees, more trees, and in the distance, more mountains and some roads, it wasn’t much but it was one of the greatest feelings I’ve ever had in my life, being on the top of Maine, but we didn’t stay there long. As soon as we had gotten higher than the trees it was like we were walking on the moon and it was really windy and cold. For maybe twenty minutes we stayed there eating lunch and taking pictures and enjoying the moment. Then finally, we had to go. I didn’t want to leave the roof of Maine but we had to go. We were planning to go down the Saddle Trail and back down the Chimney Pond Trail, so that’s just what we did. It was interesting going down that trail because we were basically walking down a rockslide. Sometimes we even had to slide down on our butts to avoid hitting rocks down the rockslide into other people. About halfway down the Saddle Trail we went off to the side onto a little ledge with some other people to have a rest. Then, we realized that the eclipse was happening right then so we slipped our packs off and pulled out our NASA glasses and put them on. I looked up at the sun and was amazed. Probably half of the sun was covered up by the moon. You could barely tell it was happening without the glasses. Then, we lent our glasses to the people next to us and when they looked through they were fascinated too. It was really cool to see a solar eclipse right on the mountain. After that we went back down to Chimney Pond and had a little snack and hiked all the way back down to Roaring Brook Campground and had a little refreshing swim in the swimming area. We stayed one last night at Roaring Brook and went home. That was one of the most physically challenging hikes I’ve ever been done. It was also the most fun hike I’ve ever done. 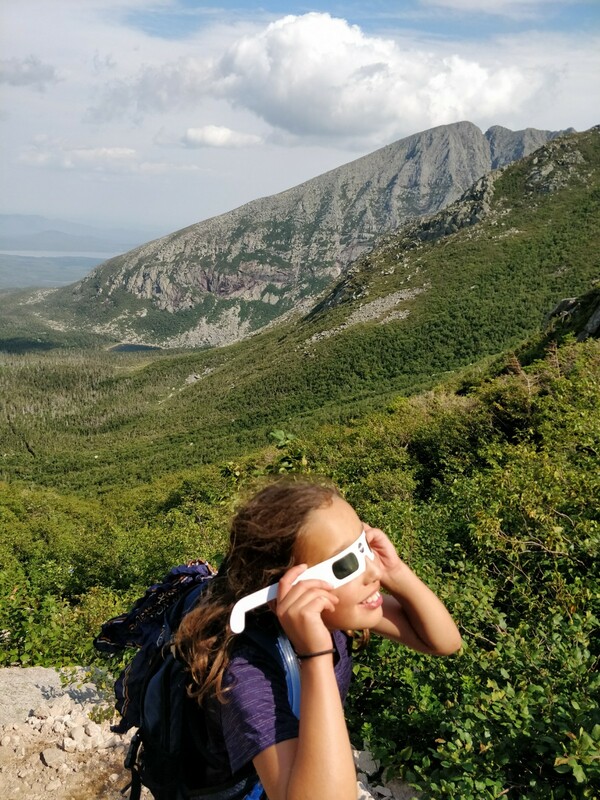 We plan to hike Katahdin every year possible. I had a really good time there.